There isn't one single known cause of DDH. In some cases there is laxity or looseness of the ligaments around the joint. This may be hereditary. 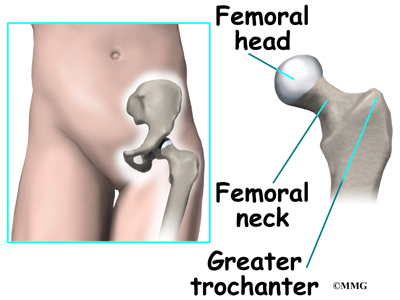 In other cases the infant's position may affect how the hip joint forms, either during growth inside the mother or after birth. Hip position and free hip movement remain important during the first months after birth. This is when the hip continues to develop and forms a deep socket and stable joint. 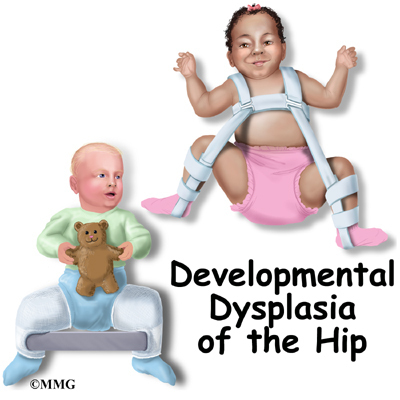 An infant carried on a parent's hip with the child's hips bent and open wide is less likely to develop DDH. Infants in some cultures are swaddled or wrapped with the legs together and extended out straight. For example, in some Native American cultures infants are carried on a papoose board. The infant is wrapped on the papoose board with the legs straight down and bound together. An infant that spends a good deal of time in this position is at greater risk for DDH. DDH is more common in Chinese, Korean, and African American infants. DDH is much more common in girls than boys. This may be linked with hormonal differences. Estrogens and a hormone called relaxin present during development in utero and still present at the time of birth may cause generalized laxity or looseness of the ligaments. 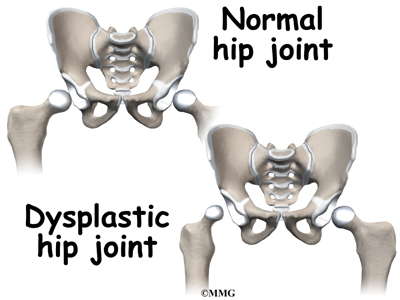 The left hip is affected more than the right hip. Again, this is probably linked with position before birth. The most common position in utero places the child's left hip next to the mother's spine and limits hip motion. Children with developmental disabilities who do not move normally or who can't stand up and walk are also at risk for DDH. The newborn, infant, or young child may not have any symptoms such as pain to signal a problem. There may be some differences in how the legs and buttocks look from side to side. Sometimes the problem isn't noticed until the child starts to walk. If only one hip is affected, the child may walk with a limp. 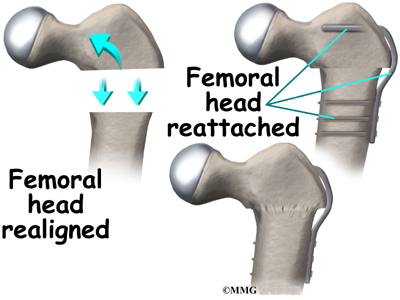 If DDH is present in both hips, the child may sway from side to side or waddle. When both hips are dislocated, it is sometimes very difficult to see an abnormality in the way the child walks. Special tests are performed by the doctor while the infant is still in the nursery, The doctor is trying to look for signs of an unstable hip. 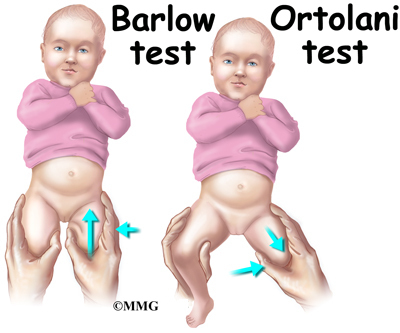 The two most reliable physical exam tests are Ortolani's maneuver and Barlow's test. 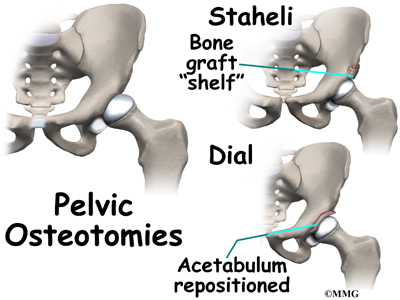 These tests are designed to detect if the hip is sliding in and out of the acetabulum. To perform these tests, the doctor places the infant on a table in a supine position (on his or her back). The doctor then abducts the hips by moving the bent hips and knees apart. 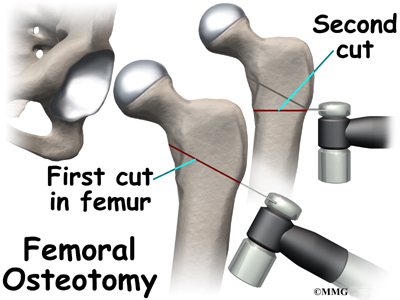 If the hip feels like it can be pushed out the back of the socket, this is considered abnormal. 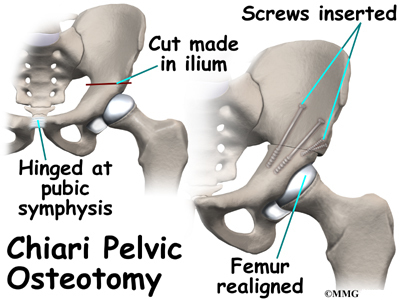 This is called a positive Barlow's Test and is a sign of instability in the hip. 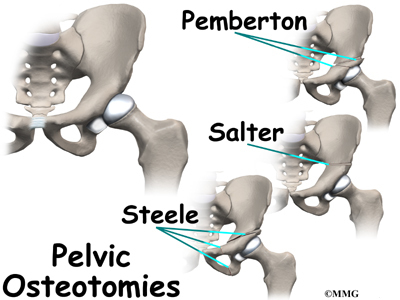 As the hip is abducted further, the doctor might feel the ball portion (the femoral head) slide forward as it slips back into the socket. This is called a positive Ortolani Maneuver and is also a sign of hip instability. If either one of these tests are positive, the child will be watched closely or immediate treatment with a brace may be considered. 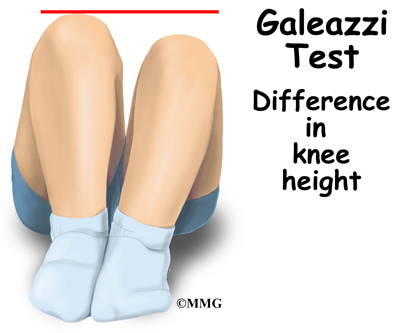 For the infant three months or older, Galeazzi's or Allis' test can be performed. The child is placed in the supine position with the hips and knees bent and the feet flat. The examiner looks for any unevenness between the knees. 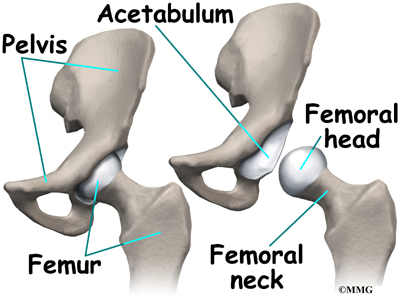 If one knee is lower than the other, there may be a dislocated hip on the lower side. X-rays aren't reliable in infants but may be of some diagnostic value in the older child. Ultrasound is more accurate in the first six months of life. There are several ways to treat DDH depending on the child's age and the severity of the condition. Double and triple diapering may be all that is needed in the first six weeks. 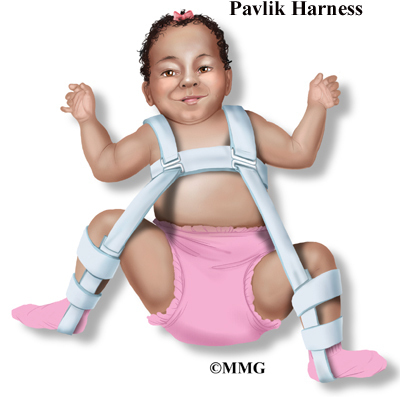 If the problem persists, a special harness called the Pavlik harness can be used for three to nine months. The harness keeps the hip in flexion and abduction. It may be worn until the doctor can no longer move the hip in and out of the socket. In the older child, x-rays may be used to confirm that the hip is stable. 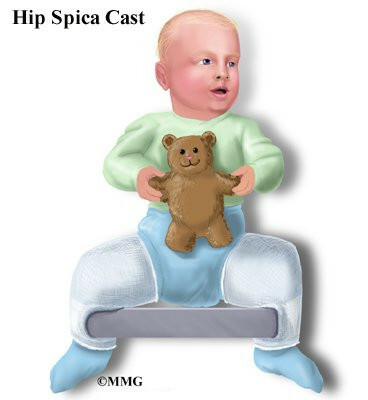 Once the hip can be put back in the socket easily, the child is put in a hip spica cast from waist to toe. This cast holds both legs so that the hip joint remains in one position - in the socket while the soft tissues around the hip tighten to hold the hip reduced. The cast may be needed for several months to hold the hip in place. The cast usually is replaced every two weeks to one month while it is needed. Each time the cast is changed, the child is taken to the operating room and placed under general anesthesia. This treatment is called a closed reduction. The child in a Pavlik harness benefits from as much motion in the hip as possible - while still keeping the hip reduced. 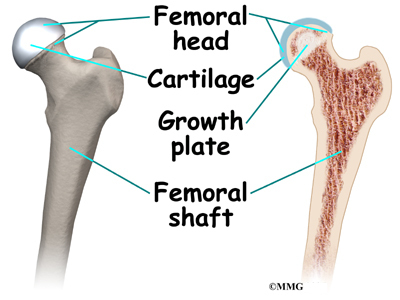 Motion allows for nutrition of the developing bone and cartilage inside the hip joint. The therapist will review positions to avoid such as sidelying with the top leg down toward the other leg past the midline. The harness must be used continuously until the hip is stable. Use may be gradually decreased to just nighttime wear before finally stopping.